This is a report from the Play by Email campaign that I run. This battle was fought as a test for my home-grown rule set “Est-il Heureux?” which I use for battle demonstrations at Napoleonic reenactment events. The game is played on a two foot square card table, ruled into two inch squares. An aerial view of the battlefield is below. A plan of the field at Almanza. 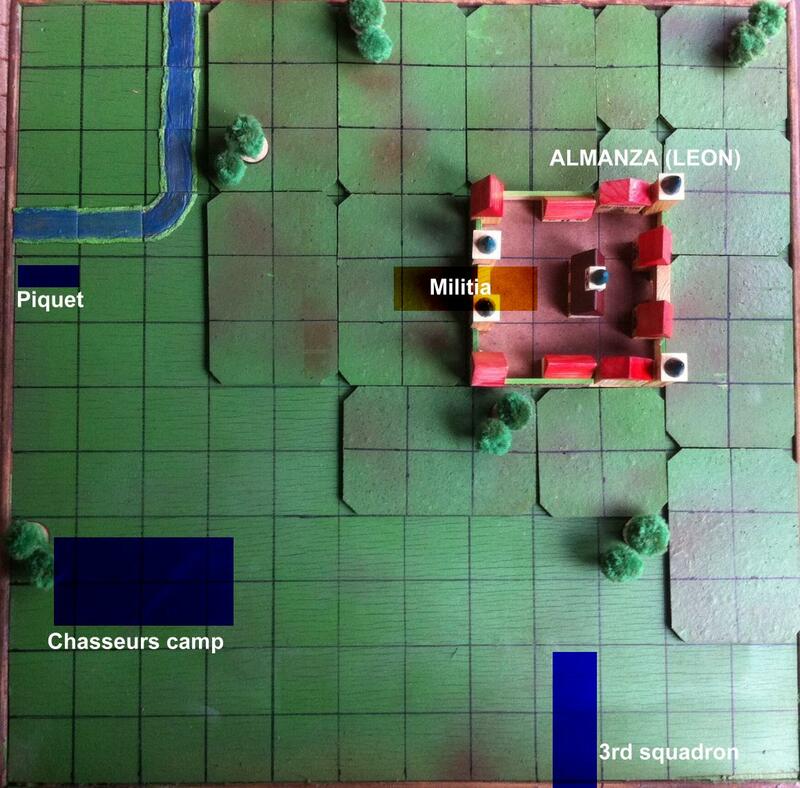 At Almanza, in the province of Leon in northern Spain, two squadrons of French chasseurs a cheval have been camped outside the town for a few days. They had previously attempted to enter the town but the local militia turned out and barred their way. Since then they have been foraging for supplies and waiting for reinforcements. On the night of 20th June a party of guerrillas attacked the French camp and both sides suffered losses. On the evening of 21st June a deputation of local men came to the town hall demanding that something be done about the raids on their farms by the French cavalry, and the Mayor mustered almost 400 militia for a determined attack in the morning. On the morning of the 22nd, as the militia began to march out of the town’s west gate, a third squadron of chasseurs appeared on the road from the south. The French with between 250 and 300 men now felt strong enough to attack, particularly as the enemy had moved outside the town walls. The area around Almanza is generally flat with scrub and small copses. The town stands on a plateau. Two squadrons of chasseurs mounted up and moved out of camp towards the town, while the newly-arrived third squadron moved west to join them. There was a detachment guarding a bridge on the west road which also moved towards the town in scouting order to threaten the militia’s flank as they deployed to meet the main attack. A few of the cavalry were shot during this approach, but not enough to give them any problem. The first squadron of chasseurs charged the Spanish as they were deploying. Unable to form square in time, the militia managed to fire a volley and several cavalry fell from the saddle. The attack stalled. The Spanish on the western flank fired again at the skirmishing cavalry and forced them back. On the southern flank the French formed up again for a charge on the centre of the Spanish line, which responded by forming square. The French charged, and although many cavalry were lost, the square was broken and the survivors were cut down. A party of guerrillas left the town by the south, planning to move on the French flank. Meanwhile the Chasseurs who had broken through entered the town by the now unguarded west gate and made their way towards the main square. In this they were interrupted by groups of guerrillas in the houses and alleyways. A confused skirmish took place and all the French were killed or fled. Outside the town the militia renewed their fire and eventually the Chasseurs pulled back.